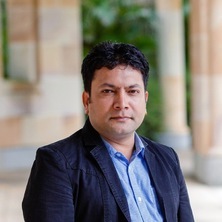 Dr Kamalesh Adhikari is AIBE Research Fellow and Member of the ARC Laureate Project ‘Harnessing Intellectual Property to Build Food Security’ at the TC Beirne School of Law, The University of Queensland. Dr Adhikari's current research looks at the role of networks, informality and community seed banks in shaping the governance of biodiversity and seed systems across developing and least-developed countries. He is also undertaking a critical account of the concept of farmers’ rights in intellectual property law. Dr Adhikari previously worked at the South Asia Watch on Trade, Economics and Environment (SAWTEE) and has undertaken collaborative work with a number of institutions including Consumers International and the Southeast Asian Council for Food Security and Fair Trade (Malaysia), United Nations Food and Agriculture Organisation (Italy and Nepal), Fridtjof Nansen Institute and the Development Fund (Norway), International Development Research Centre and International Institute for Sustainable Development (Canada), Sustainable Development Policy Institute (Pakistan), Consumer Unity and Trust Society and Green Foundation (India), Oxfam Novib and Wageningen University (The Netherlands), United Nations Development Programme (Nepal and Sri Lanka), and Institute of Policy Studies and Law and Society Trust (Sri Lanka). Adhikari, Kamalesh Intellectual Property Rights in Agriculture: Legal Mechanisms to Protect Farmers' Rights in Nepal. Kathmandu, Nepal: PRO PUBLIC and SAWTEE, 2008. Adhikari, Kamalesh (2015). Regional seed bank and material transfer arrangements in South Asia. In Abid Suleri and Vaqar Ahmed (Ed. ), Making growth inclusive, just and sustainable in South Asia (pp. 147-153) Islamabad, Pakistan: Sustainable Development Policy Institute. Tone, Winge, Adhikari, Kamalesh and Andersen, Regine (2013). Advocacy for farmers’ rights in Nepal. In Regine Andersen and Tone Winge (Ed. ), Realising farmers’ rights to crop genetic resources: success stories and best practices (pp. 181-194) Abingdon, United Kingdom: Routledge. Paudyal, Bikash, Adhikari, Kamalesh, Shrestha, Pitambar and Tamang, Bir (2012). Nepal: innovative mechanisms for putting farmers’ rights into practice. In Manuel Ruiz and Ronnie Vernooy (Ed. ), The custodians of biodiversity: sharing access and benefit sharing of genetic resources (pp. 135-162) London, United Kingdom: Earthscan. Adhikari, Kamalesh (2009) Seeding disaster. Himal South Asian, 3: 23-29. Adhikari, Kamalesh (2016). History, Growth and Implications of Formal Seed System in Nepal. In: South Asia Watch on Trade, Economics and Environment, Kathmandu, Nepal, (). 2016.